loading of coins by the Universal® Model 360 coin counter. The Model 360 will then trigger the bagger to automatically heat-seal, detach and release a sealed bag of coins. The bagger repeats the cycle by automatically indexing next bag forward for coin loading. Bagger uses preformed Autobag® plastic bags-on-a-roll. Bags come in a variety of styles and sizes in plain or preprinted in up to six (6) colors. Fast and easy bag changeover is accomplished in approximately two (2) minutes. Will accommodate bags weighing up to 5 pounds (2.3 kgs) with the standard product support shelf. Capable of packaging bags weighing up to 20 pounds (9 kgs) with the optional heavy-duty load shelf. Can be combined with a thermal in-line imprinter for identification and labeling, if customer chooses not to use preprinted bags. 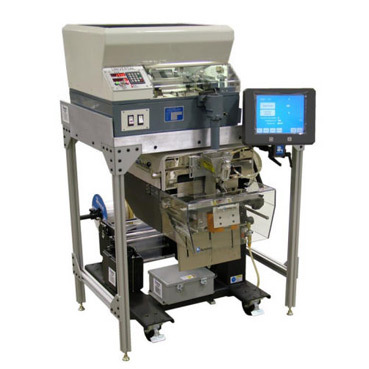 An in-line imprinter adds more flexibility for future coin and denomination changes.